In medium bowl, stir together Crust ingredients with spoon until are well blended. Spread mixture in bottom of 12-inch cast-iron skillet. In medium bowl, beat sugar, 3/4 cup softened butter and the cream cheese with electric mixer on high speed until well combined. Add eggs 1 at a time, beating well after each addition. Beat in extract and peel. Alternately beat in flour and milk, beginning and ending with flour, until well incorporated. Add condensed milk; beat just until combined. Pour batter over crust in skillet. Bake 45 to 50 minutes or until top is light golden brown and center has only a slight wobble when skillet is moved. Cool completely in skillet on cooling rack, about 45 minutes. Top cake with whipped cream and raspberries. Sprinkle lightly with powdered sugar. Garnish with lemon slice. 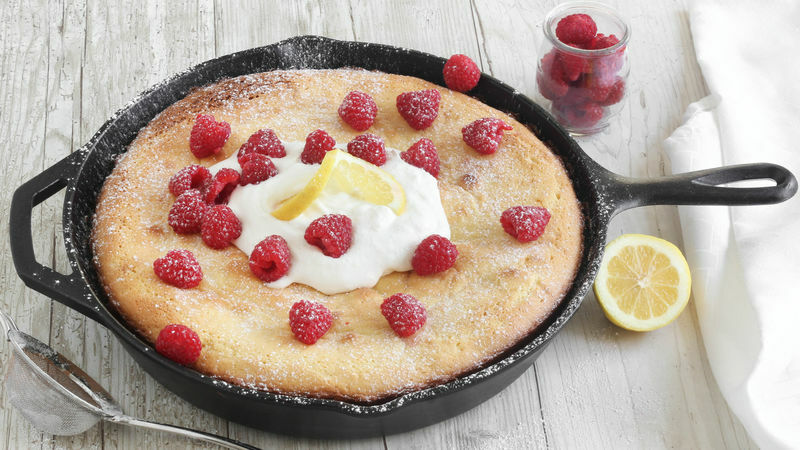 Serve cake from skillet. Transfer any remaining cake to a plate; cover with plastic wrap and refrigerate. The middle of the cake should have a slight jiggle when you remove it from the oven. Be careful not to overbake this cake. It will continue to bake a little even after it is removed from the oven. Change up the berries! Blackberries, blueberries and strawberries all go well with the flavor of this cake, so pick your favorite.